May 11: Partnership for a Secure America (PSA) and the United States Institute of Peace (USIP) hosted an off-the-record roundtable lunch discussion on the recent conflict in Yemen. In September 2014, the Ansar Allah (aka Houthi) rebels took control of the capitol of Sana’a. In late March 2015, Saudi Arabia — with support from various allies — launched an air campaign against the Houthis. Speakers discussed the political, religious, and tribal drivers of conflict in Yemen, the impact of the conflict on the Middle East, and possible implications for U.S. policy in the region, particularly concerning the War on Terror. Since 2004, the Ansar Allah (Houthi) rebels have been engaged in armed conflict with the government of Yemen. Though part of the uprising that led to the ouster of then-President Ali Abdullah Saleh, the rebels have since continued their conflict against the post-Arab Spring government of President Hadi, the first Sunni leader of Yemen in 1115 years. During the last year support for the rebellion has expanded beyond its Houthi base to include most Zaydis and many Yemeni nationalists. This expanded base of support resulted in the opposition seizure of the capital of Sana’a, the flight of President Hadi, the expansion of the rebel area of control to parts of the south, and military intervention by Saudi Arabia and its Sunni Arab coalition partners. Saudi Arabia portrays the current crisis in Yemen as a war to prevent the expansion of Shia Iranian influence into the Arabian Peninsula, as the Zaydi Shia Houthis have received support from Iran. The situation is far more complex and subsumes a variety of political, social, and tribal tensions in addition to sectarian and Saudi/Iranian conflict. The conflict in Yemen has drawn in a variety of regional actors and threatens to reverberate not only across the Gulf but also across the wider Middle East and North Africa region. The United States vigorously supports its Saudi ally. In so doing, however, Washington finds itself in the uncomfortable position of being on the same side with Al-Qaeda, ISIS and the Muslim Brotherhood in Yemen while actively engaged in military conflict with many of the same forces in Iraq and Syria. The Saudi attack in Yemen has shifted the focus of many regional states to confronting Iran and away from the struggle against radical extremism in the Sunni Arab community. 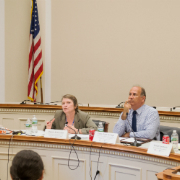 This was the 21st event in the USIP/PSA Congressional Briefing Series – Topics on International Conflict Resolution and Prevention, an educational program designed to provide congressional staff with opportunities to engage leading experts and fellow Capitol Hill staffers in bipartisan forums. The program aims to build cross-party relationships, encourage bipartisan dialogue, and equip staff with new perspectives on critical issues in the international conflict resolution and prevention field.